The modern enterprise workforce poses new challenges for IT. Today’s employees work in more places, on more devices— personal or company-owned—and over more networks than ever, using a diverse array of datacenter applications, mobile apps, SaaS and cloud services. 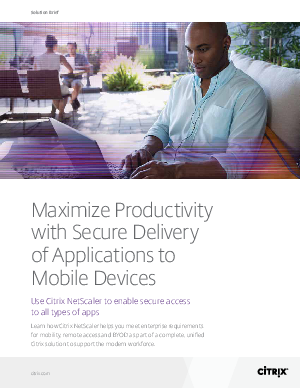 As they move among apps, networks and devices, IT needs to be able to control access and ensure data and application security without impeding productivity. That means enabling users to get to work quickly and easily in any scenario without having to deal with different ways of accessing each app. Traditional VPNs and point solutions add complexity for both users and IT, increase costs and fail to enable a holistic approach to business mobility. Over the years, many IT organizations have addressed these evolving requirements through point solutions and by case-by-case configuration of access methods. The resulting fragmented experience poses a key roadblock to productivity and increases user frustration. For IT, the lack of a unified solution increases cost and complexity while impeding a holistic and comprehensive approach to security. For users, it means an inconsistent experience with multiple URLs to access applications. To meet the needs of both users and IT, you need a simple, secure and unified way to deliver all types of apps to all types of devices.